There are a number of reasons why people tend to believe that canned foods are bad for your health. Some people claim for instance that canned foods themselves are less nutritious compared to fresh food. Others, like to focus on the can packaging and claim this may negatively affect the food inside. Although there are plenty of claims out there suggesting that canned food is bad, many of those are not based on scientific data. So which claims are true and which are false? And are canned foods really that bad for your health? In this article, we’ll have a closer look at what canned food is and whether it’s really that bad for you as most people like to believe. The article mainly focuses on whether canned food is less nutritious and if can packaging itself affects the food. 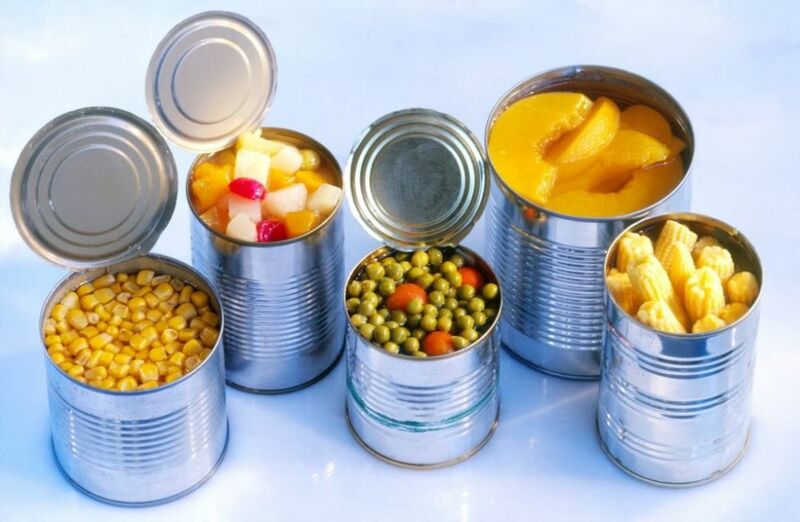 The process used to store foods inside a tin can is called ‘’canning’’. Canning simply is the method of storing food, or any other type of product, inside an airtight tin container. This method of storing food was first introduced in the late 18th century and has been along ever since. After a certain food has been canned, its shelf life will increase up to a whopping 5 years or longer. Foods that commonly get canned include soups, vegetables, meats, and fruits. Does canning affect the food’s nutrient levels? One of the most common arguments you’ll hear when people claim that canned foods are less healthy compared to fresh foods is that canned food is less nutritious. But is this really true? Well, according to recent studies, the answer to this questions is NO. Research has shown us that, in most cases, canned foods do not contain fewer nutrients compared to fresh foods. In fact, canning can even preserve most of the food’s nutrients in a much more efficient manner compared to other packaging methods. The most important nutrients in your food such as protein, carbs, fat, and most minerals and vitamins are all retained after food is canned. Therefore, you can be assured that the food still contains its original amount of nutrients when you open the can, even if this is 5 years after purchase. This does, however, not mean that all types of nutrients stay preserved. Because the process of canning itself involves heat, many water-soluble vitamins such as Vitamin C and Vitamin B can become damaged in the process. As a result, they will dissolve and get lost. This is, however, not a major problem. Because these vitamins are sensitive to heat, they likely disappear anyway while you are cooking your meal. This means that, unless you eat your food raw, it is unlikely it contains much Vitamin C or B to begin with. And although canning might damage certain vitamins, the process may, in fact, increase the amounts of other nutrients and healthy compounds in food. Canned tomatoes and corn, for example, is known to release more antioxidants compared the fresh ones. As a result, the canned versions of these foods are a better source of antioxidants. The fact is that, no matter what you have heard, canned foods are a great source of important vitamins and minerals. Therefore, most claims that are based on canned foods being less nutrient compared to fresh foods are nothing but myths. Does can packaging affect my food? There are people out there who claim that canned food is bad for you not because it’s less nutrient, but because it may contain unhealthy chemicals. The fact is that tin cans can, in fact, contain certain types of chemicals that can leak into the food. Perhaps the best-known chemical when it comes to food packaging is BPA. For those of you who are wondering ‘’what does BPA stand for’’; BPA, short for Bisphenol-A, is one of the most commonly produced chemicals in the world. It is mostly used for the production of plastic, however, it can also be used to created resins and other types of coatings. When talking about canning, BPA comes in the picture in the form of a coating. The inside coating or lining of a tin food container is likely to contain BPA. This is especially the case with larger containers used for soups and vegetables. Studies show that food containers that contain BPA can in fact leak this chemical into the food content. When this happens, the chemical will enter your body upon consumption. Recent studies have shown that people who consume 1 serving of canned food daily for a period of 5 days experienced a staggering 1000% increase in their body’s BPA levels. But is this also dangerous? The dangers of BPA are still a topic of debate among health care professionals. Whereas some claim that the chemical, when consumed in small numbers, is harmless – others advise it’s better to stay clear. In fact, numerous international health organizations advise is to stay away from BPA all together and some national governments have prohibited the use of BPA in certain products such as baby bottles. So if you’re trying to minimize your BPA exposure, eating canned food may not be the best option for you. Luckily, more and more packaging manufacturers are becoming aware of the (potential) dangers of BPA. As a result, BPA-free packaging is produced that does not contain any traces of this chemical. Certain types of plastics are BPA-free and most small metal tin containers such as the ones used for candy and cosmetics also are 100% BPA free. When eating canned foods from large tin cans, however, it is advised to stay cautious. Should I eat canned foods? Your choice on whether you should or should not eat canned foods is a personal one. Whereas the claims based on the assumption that canned foods contain fewer nutrients are likely to be false, canned foods can bring along other issues related to BPA and other chemicals. Canned foods are healthy and rich in nutrients. As of such, they can be part of a healthy diet. It is, however, important to read the labels and choose accordingly. Whenever possible, try to pick canned items that are stored in BPA-free containers. After all, it’s better to be safe than sorry. When doing so, the consumption of canned foods is, generally speaking, completely safe and healthy.